• Rascal needs votes to defeat the Crazy Hot Dog Vendor, Louie, C. Wolf, and all the other mascots of the Eastern League in this year’s MiLB Mascot Mania. 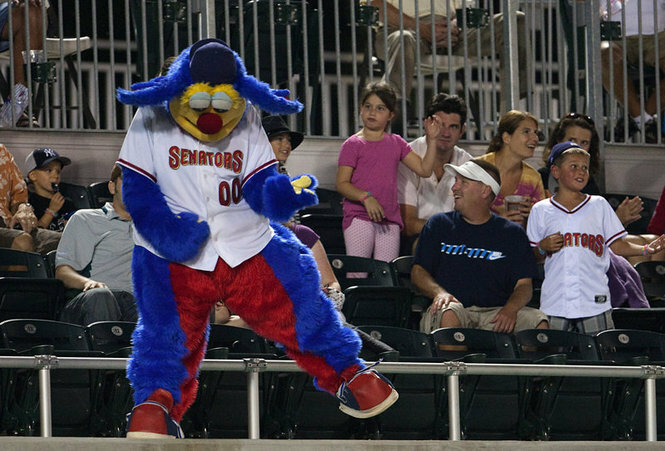 • The first inkling of Harrisburg’s 2014 schedule has trickled out as the Senators will face the Fightin Phils 19 times (nine home and 10 away) and the Fisher Cats eight times (four home & away). • There’s still time to bid on the Senators Stars & Stripes and Pink Day game-worn autographed specialty jerseys here. • After compiling a 5-7 record with a 5.86 ERA in 20 games at AAA Buffalo, Claudio Vargas (’02-’03) was released from the Blue Jays’ organization. • The York Revolution added Zack Segovia (’08-’09) to the pitching staff for the stretch run. • Matt Antonelli (’11) made the tough decision to retire as he enters the next phase of his career becoming a student assistant next season at Wake Forest. This entry was posted in Roll Call and tagged 2014 schedule, Claudio Vargas, Mascot Mania, Matt Antonelli, Rascal, specialty jerseys, Zack Segovia. Bookmark the permalink.